In this latest adventure, Rose, Captain Jack and of course the Doctor, land on a planet where fiction is outlawed. Residents are not allowed to use their imagination and lies are punishable by imprisonment and forced psychiatric treatment. The Doctor is quick to notice that progress has stagnated. It seems that without the ability to dream and imagine, humans cannot advance because they cannot conceive of innovation. The Doctor is on the case but it seems that Hal Gryden, with his illegal television station is already working to change people's view of fiction and fantasy. When things start to go just a little haywire the Doctor is forced to admit that sometimes, fiction can be dangerous. Of all of the 9th Doctor books, The Stealers of Dreams is easily my favorite, though there isn't much that is original about the plot. In many ways, it's as though Lyons tried to rewrite 1984 and insert the Doctor. The planet in question has no government but the rule of law is unbending and the status quo if fiercely maintained. Conformity is uniform with residents watching each other and informing on each other at every turn. There are those who choose to rebel but they are quickly rounded up by the police and their materials dismantled. For this world to work, it's important that everyone think the same way and express a desire for truth and rationality in all forms. The news reports things like a woman not having to stop at any red lights on the way home and saving a full twenty minutes on her commute. Despite the fact that the story was not original per say, I really enjoyed the twist ending. I don't know whether it's because I got so caught up in how well written Rose, Captain Jack and the 9th Doctor were or not but I completely didn't see it coming and was blown away. In reflection afterwards, I will admit that I should have been able to see it. If anything, it speaks to how caught up I quickly became with The Stealers of Dreams. At points throughout the novel Rose was constructed as a Mary Sue. This would normally piss me off but she seemed to push back very hard against this construction. 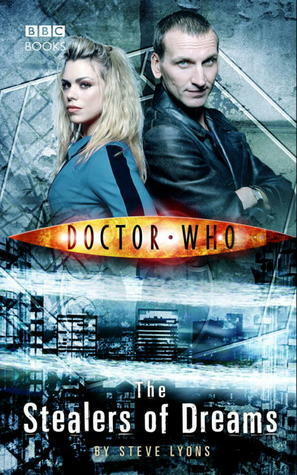 Rose meets Dominic when he breaks into the hotel room that she shares with Captain Jack and the Doctor to hide from the police. Later in the absence of Captain Jack and the Doctor, Rose decides to investigate the world with Dominic. It's clear from the very beginning that Dominic is very socially awkward because of his non compliance and interest in fantasy and this makes him decidedly unattractive to women. Dominic repeatedly tell us that he finds everything about Rose perfect but it's clear that his ideas on women are really and truly sexist. When the two find themselves in danger of being caught by the police, Dominic assumes that as a man, it's his job to protect Rose. Rose being Rose gets ready to defend herself despite Dominic's protestations. She's certain that she's onto something about how the world works and refuses to be taken by the police. Dominic's attitude about women don't stop at his belief that it's a man's job to protect a woman. ‘The comic strip,’ he answered distractedly, over his shoulder. Dominic broke off from what he was doing to turn and stare. ‘You’ve studied the classics? In a society without any government it's clear that the media controls how people think. What's particularly telling is that for Dominic, though he actively chooses to protest against the media and society's limitation regarding fiction, he doesn't stop to think about what he is internalizing from the fiction he chooses to consume. It takes Rose to point out that the presentation of women is problematic. I love that Lyons had Rose push back against this misogyny and it's rare that sexism is so directly confronted in NuWho. As much as I enjoyed Rose's push back against sexism, I am somewhat bothered that she was sidelined when she succumbed to the "fantasy madness." How is it that Captain Jack who was breathing same air as Rose, managed to hold onto his sanity and even save himself when necessary and Rose couldn't? In the end Rose inspires pity in the Doctor because of her temporarily effected brain but true to Rose's spirit, she doesn't give up for one moment. The Doctor had never pretended he could save her from everything. Rose didn’t even want him to. As if she hadn’t read his expression when he’d asked for a camera person, caught the flicker of his eyes towards her. He had to know by now that she wouldn’t have taken him up on his offer, his way off the front line. As for Captain Jack, I would have to say that he was dead on the money. It was easy to picture him moving from bat to bar drinking beers, telling tall tales and being completely in his element. Other than flirting like the cutie pie that we all know that Captain Jack is, he spent most of his time in absolute horror at how this world treated those it considered to be mentally ill.
Jack had made up his mind. ‘What they’re doing here,’ he said, ‘it’s wrong. I don’t care if the inmates in this place are sick, if fiction is driving them nuts or what – what they did to you, what they tried to do to me, it’s just. . . it’s wrong. Akin to the Doctor and Rose he was determined to find the underlying cause however much of the time he spent talking about what is appropriate mental healthcare consists of. People being locked up for years, having their brain operated on against their will and forced to deny things like a belief in God were particularly disturbing to him. In terms of the latter, it's not that Captain Jack is a believer himself but a believer in the right to freedom of religion and expression. In many ways, Jack represented the heart, and compassion of this story. As with Rose and Captain Jack, I feel that Lyons pretty much got the 9th Doctor right. There is however one passage I think that he slipped. ‘Creeping up on us right now, and what good are you gonna be when they pounce? Standing there with your fingers in your ears and your eyes closed. The Doctor is often a cold and abstract. Rose even reminds us in this book that he has a tendency to refer to humans as apes. What the Doctor isn't is malicious or at the very least it's fair to say that the 9th Doctor is not a malicious person. I simply don't see him taunting and scaring an innocent person for the sake of funsies. I don't see him scaring a person he knows to be ill in some fashion. As you may have guessed from some of things I've said in this review so far, mental illness plays a big role in this story. People who consume fiction or create fiction get fiction sickness which very much mirrors mental illness. Residents are taught to focus on things they know to be real about their lives or their environment to fight off illness. Fantasy sickness is also something which is perceived of as contagious and therefore a person telling a lie to another risks infecting them with mental illness. In the end we discover that mental illness is caused by something environmental but it still feels in many ways like all mental illness is about having delusions excluding things like depression for instance. I do however like the strong point that people who are ill are entitled to good care and not to be locked away from society. As much as I loved so many facets of The Stealers of Dreams, it is not a very inclusive story when it comes to race and sexuality. I know that Captain Jack is bisexual but this book is yet another example where it is not explicit. Doctor who gets more credit for LGBT inclusion than it deserves to be quite frank. There are two characters of colour and of course they are on the side of preserving the status quo. One is Cal Tyko who is described as being of "Oriental descent" and is the duty nurse at the White House where people who have fantasy sickness are taken for treatment. The Stealers of Dreams is ten years old but even ten years ago, the correct term to use was Asian. Unfortunately Cal Tyko's character is a trope - the inscrutable Asian man. He is also power hungry, cold and calculating. Then there's Waller the dark skinned police officer. Waller is absolutely driven to bring an end to the illegal broadcasting of fiction. She is dedicated to her job and will do anything not to lose face. Waller also happens to be the only character other than Rose who inspires any kind of pity from the Doctor. We learn all about Waller's history with mental illness but little about her beyond that. Waller is quite literally a walking avatar of her illness. The Stealers of Dreams could very well have been an episode with the exception of the moment of the Doctor's maliciousness. The characters felt real to me and I became caught up in the story, reading it one session without a break. It very much reminded me of the things I loved best about the 9th Doctor and made me miss him all the more. It's fitting that this is the 9th Doctor's last book and the one that got the most right. If you're a fan of the 9th Doctor or even Doctor Who in general, you'll enjoy this book.